Tala in Satkhira, in the South West corner of Bangladesh is one of the most vulnerable coastal areas in the country. Ground water is contaminated with arsenic, iron and saline and surface water is riddled with bacteria. People drink pond and rain water during the monsoons and unsafe iron, arsenic and saline contaminated water from tube wells for the rest of the year. A huge amount of time is spent fetching inadequate water from long distances. This situation is changing. With the help of entrepreneurs who sell safe and treated water to peoples doorsteps. Ronny was a member of a village Water, Sanitation and Hygiene (WASH) committee, when BRAC was looking for budding entrepreneurs in the area. 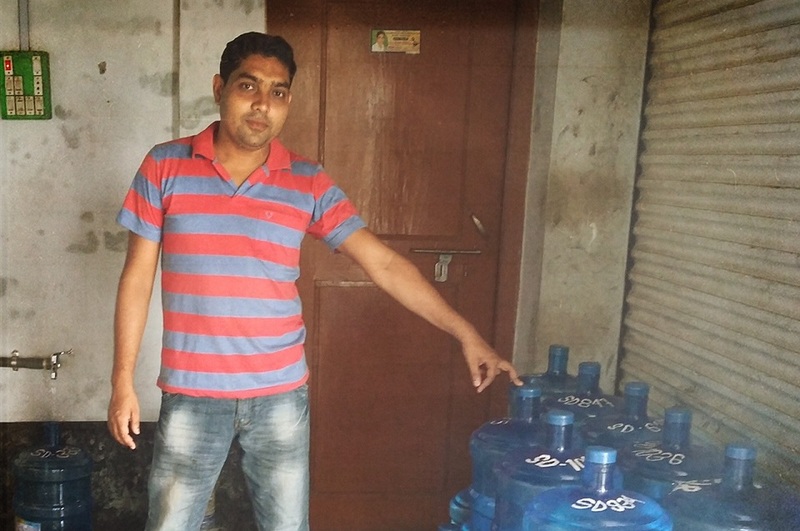 Finding entrepreneurs and providing them with financial assistance and technical know-how BRAC supports them to start their own water treatment business which gives them an income and helps the whole community access quality water. Ronny was enthusiastic and immediately applied for a loan and purchased a water treatment machine and materials which he kept at his shop. BRAC covers the up-front cost of the project and Ronny pays a security deposit, and then repays the loan through monthly installments. As soon as Ronny’s water treatment machine was up and running, he had to learn about service delivery – how was he going to get this clean water out to the community? 3. For the customers who don’t want their drinking water delivered, they bring their own jars to the shop and have it filled for BDT 15. Ronny’s business is very successful. He is able to pay for a van driver, a marketing manager, a manager for his water treatment plant and shop and repay his monthly installments. His water treatment plant regularly supplies drinking water to more than 800 families, an estimated 4000 people, in five villages of Tala. More than 2,400 rural sanitation entrepreneurs have received loans and more than 5,500 have received orientation from BRAC WASH. We are working with a few water entrepreneurs to ensure the model is fit for purpose before it is taken to scale. The entrepreneurs’ ability to repay loans at 100 per cent shows the appetite of the market and the need for these services in the community. Read more about BRAC’s nine years of scale and innovation in WASH activities in Bangladesh here.